Gelocast Unna Boot Dressing by Jobst is designed to evenly distribute a specialized zinc oxide and calamine formulation over irritated skin, ensuring that patients receive a high quality healing experience. 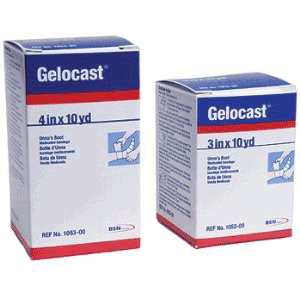 The zinc oxide and calamine is embedded into a cotton based gauze for strength and stability. A cotton gauze is used because it is non-raveling and will not fall apart. The gauze wrap soothes, treats and heals irritated and/or ulcerated skin. After being applied, the gauze quickly dries and hardens to create a semi-rigid cast. This cast provides compression to the leg to combat venous ulcers and other problems from chronic venous insufficiency. Also, this compression therapy tool features a high working pressure with a lower resting pressure. Working pressure is the resistance the bandage offers to stretching when pressure is exerted from joint movement or muscle contractions. Resting pressure is exerted when the bandage shortens after application. Effective and calming, this gauze wrap can be used on a variety of different types of patients of all sizes and ages. Used to help healing in irritated or ulcerated skin. Designed with a soothing zinc oxide/calamine formulation that is distributed evenly throughout the entire dressing. The nonraveling gauze is easy to apply and forms a semi-rigid cast after drying. How long will they be good for if not opened. Shelf life. Per the manufacturer, the product has a shelf life of 2 years. I've tried many unna boot primers, this is the only one that does not rub off on my gloves or the patient's clothes while I'm trying to wrap It stays on the gauze and leaves gloves very clean so that I don't have to change my gloves before applying the overwrap. The 3"-wide Unna's Boot from Jobst could not be delivered to me, as I was informed by a Customer Service representative that it is out-of-stock, including from the manufacturer. Having since found elsewhere their 4"-wide model, the Unna's Boot itself works well, as have the shower boot, compression socks and wound care sock liners that I ordered. Great for easing sore feet from wearing boots or even tightly-fitted shoes or sandals. I’ve used it and I got satisfied with the result. It helped a lot in healing my irritated skin in just few days. The gauze is also easy to use and does not require technical procedures to be followed. When medication wasn't relieving my cellulitis my doctor wrapped my leg in an Unnas Boot. It was very comfortable and helped speed up the recovery. tremendously.